There are currently various stones touted as "Picasso Jasper"... a perfect example of how errors go viral and pervade the internet. This is the original Picasso jasper, mined in Utah. 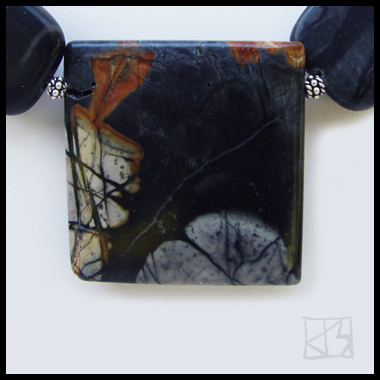 Technically, however, it is not a jasper at all but a variety of marble. 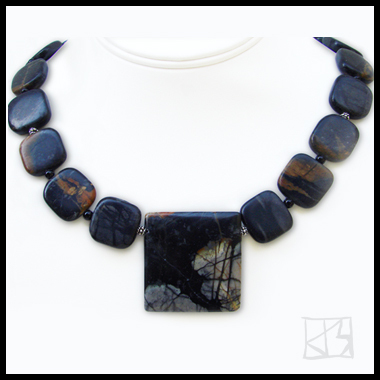 (Another internet misnomer: many sellers seem to call almost anything a jasper as if it were synonymous with the word 'stone'.) It is said to offer the wearer strength and perseverance through unexpected difficulties and challenges and believed to stimulate one's metabolism. All this aside, I simply have a thing for this earthy material, which takes a beautiful high polish, elevating it above other similarly patterned stones. Every piece tells a story, usually one of a dark winter forest. This one in particular feels like the view out a window late on a crisp November day. A touch more that 1.5 inches square, this lusciously smooth focal features different patterns on each side in shades of black and gray with touches of rusty brown. It is suspended from a strand of smaller square beads cut from the same material to match, separated by small black onyx rounds and punctuated by decorated bali silver beads. All Picasso jasper in this piece custom cut for the studio.